A little while ago I said how much I’m enjoying taking photos with analog cameras and today I wanted to share some new photos that I got developed yesterday. There’s something so magical about waiting to see how photos turn out! It’s so fun! Há algum tempo atrás disse quanto estou a gostar de tirar fotos com máquinas analógicas e hoje queria mostrar algumas fotos que foram reveladas ontem. Há algo super mágico em esperar pelas fotos e ver como elas ficam! 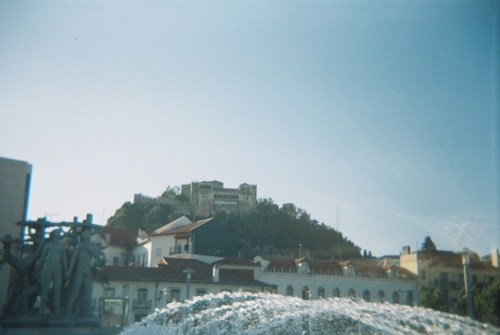 These are a few pics of Fonte Luminosa from Leiria, it’s beautiful! It’s possible to see the castle from here too. It’s amazing how people visit see everything in a different way but we that live here forget about the beauty of our city! Estas são algumas fotos da fonte luminosa em Leiria, é linda! E ainda por cima pode ver-se o castelo por aqui. É incrível que as pessoas que visitam veem tudo com olhos diferentes quando nós que vivemos aqui esquecemos-nos da beleza da nossa cidade!